This locomotive has a story. When I first came to Graubünden, Switzerland, in 1975 I was already caught by the railway virus. I was sixteen years of age and I traveled with my parents. After having settled on a camping my father brought me to the nearest railway station in Landquart. I didn't know anything whatsoever of Graubünden or its railway system the Rhätische Bahn. So I didn't have the slightest idea that I hit on the most illusive place to be: the central and largest shops of the entire system. When I stepped out of my fathers car my heart skipped a beat: I saw a true steam locomotive! It was love at first sight. This was my first encounter with a G4/5, no 108 to be exact. It was also my first contact with the RhB system with many more to come. Since that day no 108 was my love. I followed the engine were possible. I shot many more photos on several specials and other occasions. Of course I liked the 107, the other surviving G4/5, as well but there was nothing like meeting the 108. Many years later, in the mid nineties, my sole remaining uncle regularly visited Switzerland. He met a steam loco when he passed the local railway station of Fideris on the way from Landquart to Davos. "Darn", he told me, "that was nice, such an old steamer moving away, whistling and steaming". And he he started telling me stories of all steam experiences he had. He was from 1911 so he had many!! He new I liked the stories and every time I visited him, even after old age kept him from traveling to Switzerland, he started telling about that neat steam locomotive he met on the Fideris station. I questioned him about that day and found that he had also met the 108, so we shared the love for that engine. When he died, early 2004, I decided to buy the Bemo model from the modest sum of money I inherited from him. To commemorate him and his love for steam and the joy we had sharing that love. Building four coupled locomotives wasn't exactly common place when this design was considered. The Gölsdorf axle had only recently been introduced and not many experience had been acquired. The Mallets the RhB had where not entirely satisfying and more tractive effort was urgently needed. As early as 1902 SLM Winterthur built two 2-8-0 fixed frame locomotive for service in Ethiopia. As it happened they were built for a meter gauge railway and the RhB was seriously interested in this design. The trial runs on the RhB system proved so successful that two years later the first G4/5's were delivered. Over time 29 locomotive were built as "late" as 1915, virtually obsolescing the smaller tanks G3/4 and mallets. By RhB standards 1915 was late because it adapted quite early to that new form of traction: electric powered vehicles. In 1920 the first G4/5's went out of service and by 1927 steam traction on the RhB system was history. Six G4/5 remained until 1949/1952 when another four were sold to Spain, leaving only two, nrs 107 and 108 on their original tracks. They survived and now enjoy great interest from all over Europe, being one of the most beautiful narrow gauge steam locomotives still in active service (though mostly for specials). More on the G4/5 on the site of the Verein "Dampffreunde der Rhätischen Bahn" (Society "Steam friends of the RhB) especially on the page of steam locomotives. 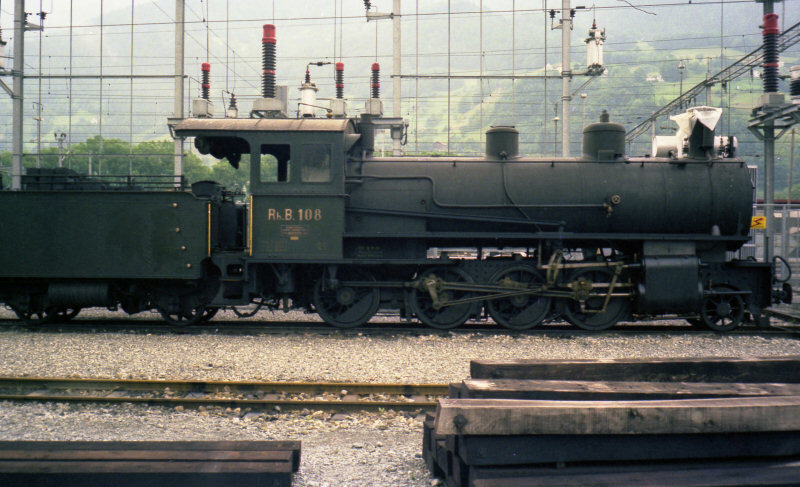 The remaining G4/5 107 and 108 were 100 years old in 2006. They are still to be seen in many specials and events. If you happen to visit Switzerland, don't miss it!! Bemo did a great job. The model is simply very good. Expensive but extremely well detailed. It runs beautifully. The wheel are blackened and drive and valve gear is delicately modeled. The inside of the cab is well detailed. The only point of criticism concerns the narrow gap between the drivers cab and the footplate. It surely influences the good looks of this model. This is not a one time error. All models I have seen have that same gap.